Owen was born on the 2nd of May 1944 at Woodbury Tasmania, to parents William (Jack) and Vonder Smith. He was one of five children, Merle, Malcolm, Gloria and William. He worked as a logging contractor, tree farmer and farmer. Owen’s favourite woodchopping discipline was the tree felling and iron man events. An Iron Man Championship consists of completing an underhand, a standing block, a single hand sawing and a tree felling consecutively. Most of his childhood was spend around the Midland area, until his parents bought a farm ‘Ferndale’, Ross. This is where he met Earl Stewart who introduced him to Woodchopping. He started Woodchopping in 1965 with his first event at the Launceston Show. 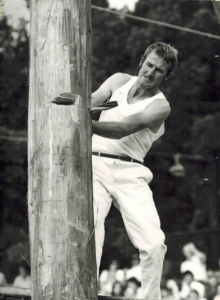 His first ever tree felling event was at the Royal Melbourne Show in 1966. He married his wife Sue in 1969 and they had two children, Mark and Anna. His woodchopping and tree felling was instrumental in his job as a contract faller and logging contractor. 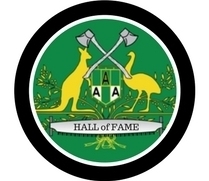 His greatest achievements were the Australian Tree Felling Championship in Hobart in 1977 in a time of 1 minute, 24 seconds and the World Iron Man Championship at Canberra Show in 1984.